Listen up, men! Flat stomach? How it works! For all men who want to shape their stomach and theighten the belt – contact us now for a free test training! A flat stomach – achieve your goal quickly and sustainably! Take the first step to your new body feeling – with the HYPOXI-Method for a flat stomach! Sign up for your free HYPOXI test training today and give the targeted method for a beautiful figure a try! The HYPOXI Vacunaut & PressureSuit targets the problem areas, stomach and hips. The pressure conditions necessary for the treatment are created in the Vacunaut column and then passed into the PressureSuit – a specifically designed suit. 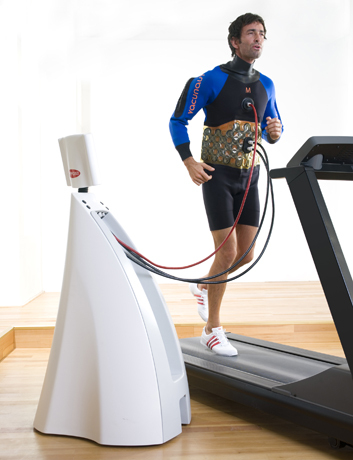 The suit’s activation chambers alternately exert positive pressure and negative pressure on the entire stomach and hip region. At the same time, you perform moderate fat burning exercise on a treadmill.